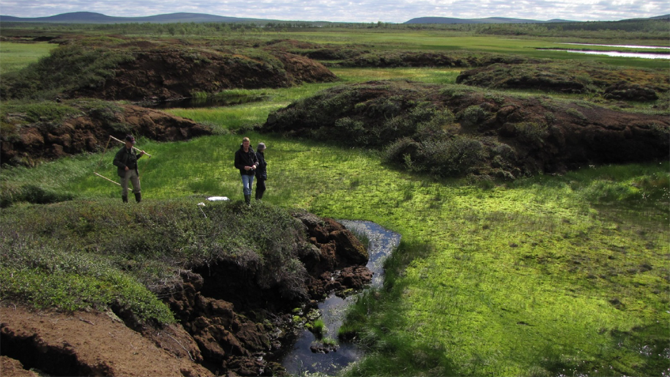 Palsas are peat hummocks, mounds or plateaus in mires with a core of permanently frozen peat and/or mineral soil. Palsas are found in the discontinuous permafrost zone and they occur, besides in Sweden, in northern Norway, Finland, Russia, Canada and Alaska. Palsa mires are a key habitat according to EU's Habitat Directive. Therefore, Sweden has a responsibility to keep them in a favorable conservation status, which implies a need for a monitoring programme. Palsas are conspicuous and sensitive expressions of permafrost which apparently have been strongly affected by climate changes. Therefore, there is a need, from a climate change perspective, to follow their development. Together with wetland and vegetation experts from Norrbotten and Dalarna County Administrations we have developed a method for the monitoring of Swedish wetlands suited for both regional and national levels. The development (2007-2012) was funded by the Swedish Environmental Protection Agency and by the Swedish National Space Board. Since 2013 monitoring of the Swedish palsas is operational within the national environmental monitoring program. The main threat to palsa mires, according to literature and results of the ongoing monitoring, is increased temperature which has resulted in substantive palsa degradation. Even complete breakdown of huge palsas has been identified. This has been accomplished by comparison of recent high resolution data (satellite imagery, laser scanning, field surveys, etc) and older data (literature, field data, digitized aerial photographs, etc).